Valdosta City Schools Pre-K Curricula are based upon the Georgia Early Learning Developmental Standards and were developed to provide a foundation for instruction in all Pre-K classrooms. They reflect current educational research and are aligned with Georgia's state standards for grades K - 12. These standards can be used for planning instruction and assessing child growth and development. Content standards cover seven key curricular areas: Language and Literacy, Mathematics, Science, Social Studies, Creative Expression, Social and Emotional Development, and Physical Development. Click here to review Georgia's Pre-K Standards. 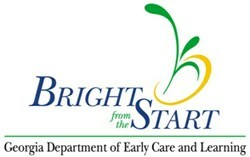 Bright from the Start: Georgia Department of Early Care and Learning (Bright from the Start) is responsible for meeting the child care and early education needs of Georgia's children and their families.